Cut in the middle of Taylor’s late-’60s and early-’70s stay at Stax, One Step Beyond qualifies as one of the singer’s best LPs. Captured in his Southern soul prime, Taylor lets loose on fine mix of gospel-inspired ballads (“I Don’t Want to Lose You“), countrified mid-tempo burners (“Party Life“), and breezy stings-and-horns soul (“Will You Love Me Forever“). And, yes, there are such unforgettable hits as “I Am Somebody” and an amazing reading of the jazz standard “Time After Time“. A must-have for all Taylorfans. 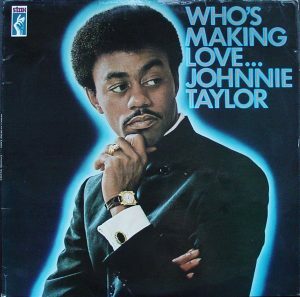 Johnnie Taylor’s ‘One Step Beyond’ was cut during an era of transition: music was now regularly recorded in Muscle Shoals as well as in the tried an true Stax studios; ‘outside’ record man Don Davis, hailing from Detroit, was increasingly assigned producing and arranging duties, causing for a rapid deterioration within the once happy Stax Family, with Stax alumnus Booker T. Jones even leaving the label (and the city) in anger. One could assume that these were not ideal settings for recording an album. Nonetheless, ‘One Step Beyond‘ may well be Taylor’s greatest, most coherent waxing. Don Davis was at the helm again, and while the grit and rawness of Southern Soul never dissapeared, the erstwhile guitarist did add a right amount of ‘sweetening’ to procedures, cooking up a trio of stellar, solid albums for Taylor between 1970 and 1974. A mesmerizing and very unorthodox spin on the Hollywood classic and Sinatra hit “Time After Time” opens the album; Johnnie’s in a sweet, pleading bag on the first couple of verses while a warm, wah-wah guitar strokes gently behind him. Hints of flute, flourishing strings, a delicate but rock steady beat and call-and-response vocalizing with the back up singers provide a magical soundscape for J.T. to testify over. Then, all of a sudden, the mood changes. Roger Hawkins kicks in a fatback rhythm while Eddie Hinton blasts out a sizzling guitar solo. Taylor reappears when the song slides back into that beautiful subdued groove. There’s a sense of darkness and despondence in the fragile “Party Life“, a heartwrenching bio of a good time party girl who ends up in the clutches of ‘the night life’. Harrowing, angelic backing vocals, rustic acoustic guitars and Al Jackson’s punishing drums on the chorus make this one of Taylor’s most poignant tracks. Much more upbeat is the jaunty, rollicking “Will You Love Me Forever“, once more featuring those brilliant backing singers, a rock steady groove and the most unexpected of instrumental perks, ranging from harps and flutes to swirling strings and fat, meaty brass. Thangs get decidedly hot (and political) with the righteous self-awareness tune “I Am Somebody“. Layered in piles of murky, fatback funk, J.T. spews out the famous Jesse Jackson line that “I am somebody“. A superb jam, the only slight problem being the muffled chirps of “watch me make it” on the chorus. The Love Man returns in full force on the brooding, slow burning “I Don’t Want to Lose You“, with its spoken intro set to a bleak, warped rendition of “Auld Lang Syne“. The proper song however is another sweaty, Southern Soul excursion, with Taylor belting out some intense lyrics. Up next is the forgotten jewel of this LP, the delightfully melancholic, wonderfully sung “Don’t Take My Sunshine“. A formidable mid-tempo ballad that is exquisitely arranged: the clavinet that trickles in during the bridge is pure genius. “Jody’s Got Your Girl and Gone” naturally was the big hit. A ferocious, army-drill styled funk opus dealing with that dastardly backstabbin’ lothario ‘Jody’, who eats your food, smokes your cigs, sleeps in your bed… and with your lady. Listen to the Philosopher of Soul and take heed. This amazing disc ends on a more low-fi, introspective note with the brilliantly bittersweet “Fool Like Me“, which truly combines the best of both worlds: the sweat-soaking passion of Southern Soul (Johnnie soars on this one) and the achingly beautiful arrangements so familiar to ‘the Detroit Sound’. Soul heaven and then some.